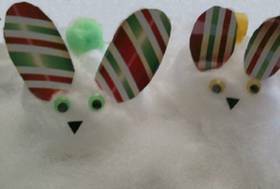 Recycle an egg carton and old cards in this playful little eco-craft to make bunnies in snow. Do you love bunnies and snow? If yes, then this is the eco-craft for you! Decorate for the holidays! And teachers this is a great craft for the classroom. 1. Take the egg carton and cut the bottom half and then cut out all the half circle cups for the body of the bunnies. 2. Take your half circle cups and glue on cotton balls. Separate the cotton slightly over the half circle. 3. Take bright old cards to make ears and nose. Then glue on ears, nose, eyes, and a pom pom tail. You now have cute bright bunnies. 4. Now separate the cotton slightly to make snow for bunnies to sit in. Then add your cute bunnies all around the snow.